All interested candidates are encouraged to visit our Department and talk to our Faculty members on any Friday afternoon. You can also visit our laboratories and ask questions about our department. Just send an e-mail to bilphys@fen.bilkent.edu.tr to make a reservation. ALES is required from resident Turkish citizens who are applying for the MS programs. Turkish citizens who are residents of foreign countries and those applicants who are not Turkish citizens may provide GRE scores instead of ALES. Applicants for PhD programs may provide either ALES or GRE scores. ALES scores are valid for 3 years. Turkish citizens who are residents of foreign countries and those applicants who are not Turkish citizens may provide GRE scores instead of ALES. Applicants for PhD programs may provide either ALES or GRE scores. GRE scores are valid for 5 years. Admission: All Applicants are required to have a B.S. degree in physics, or in a related field of science or engineering. Students with a B.S. degree in areas other than physics may be requested to take several undergraduate courses in the field to acquire the necessary background. Evaluation of applicants is based on their ALES (Akademik Personel ve Lisansüstü Eğitimi Giriş Sınavı – Academic Personnel and Postgraduate Education Entrance Examination) scores, past academic records, reference letters and an interview. Applicants who are not Turkish citizens and Turkish citizen applicants who are residents of another country may take GRE instead of ALES. All non-native speakers of English are required to submit a proof of satisfactory knowledge of English. Degree Requirements: In addition to at least 21 credit units of course work, the M.S. degree candidate must prepare and successfully defend a thesis. Expected duration to complete the M.S. program is four semesters; the maximum duration is six semesters. Admission: All applicants are required to have a M.S. degree with thesis in physics, or in a related field of science or engineering. Evaluation of applicants is based on their ALES (Akademik Personel ve Lisansüstü Eğitimi Giriş Sınavı – Academic Personnel and Postgraduate Education Entrance Examination) scores, past academic records, reference letters and an interview. Applicants who are not Turkish citizens and Turkish citizen applicants who are residents of another country may take GRE instead of ALES. All non-native speakers of English are required to submit a proof of satisfactory knowledge of English. Degree Requirements: 21 credit units of course work beyond the M.S. level is required. Ph.D. candidates must pass a qualifying exam and then must prepare a thesis work proposal. Preparing and defending a dissertation based on original research is the essence of the program. A paper based on the candidate’s thesis must be accepted or published in a reputable journal before the dissertation can be defended. The expected duration to complete the Ph.D. program is eight semesters. The maximum duration is 12 semesters. Above CGPA requirements are for PhD program applicants who already have a MS degree with thesis and for MS program applicants. Those who do not have a MS degree with thesis and want to apply to a PhD program should have at least 3.00 CGPA during their BS studies. Students who are admitted with degrees from programs other than Physics may take one year of undergraduate courses to compensate for deficiencies in their backgrounds. GRE General Test: For M.Sc. application minimum quantitative total of 153. For Ph.D. application minimum quantitative total of 157. English proficiency: TOEFL IBT(at least 87), IELTS (at least 6.5 average and 5.5 from each section) or Bilkent COPE (at least C). In addition, foreign language requirements as imposed by Inter-universities Board (ÜAK) of Turkey (minimum of 55 from YDS or its equivalents as listed by the Board, in a language other than the mother tongue) must be satisfied by Turkish citizen PhD applicants. Proof of Degree (i.e. Diploma): Yes (If already obtained). You can also apply online (Click here to access). For more detailed information please visit this page on our institute’s website. A more extensive catalog is also available from here . Financial Asistance in the form of research and teaching asistantships and tuition waivers are available. No application fee is charged for applications to graduate programs. The goal of the graduate program in the Department of Physics is to develop students into scientists who can pursue original, creative research activities. The program is an important part of the research activity of the department, which aims produce scientific output of international significance. 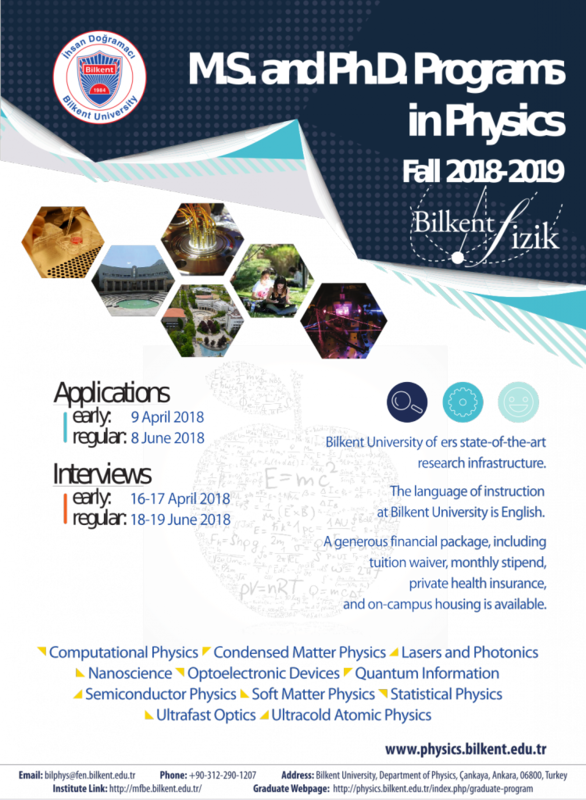 The graduate program emphasizes research in various fields of condensed matter physics, in relation to rapidly developing high-technology fields such as photonics, nanoscience, and nanotechnology. The department’s current research focuses on the theoretical and experimental study of nanoscience, the physics of electrons in lower dimensionalities, statistical mechanics, many-body physics, strongly correlated electrons, properties of new materials, fabrication and theoretical analysis of new devices, computational physics, soft matter, ultrafast photonics, and optoelectronic devices. Our graduated students pursue research and find jobs at top ranked research institutions world-wide. M.S. and Ph.D. candidates (of all nationalities) can apply twice a year (for the Fall and Spring semester beginning in September and February respectively), upon sending a filled-in form, official transcripts, scientific proficiency test scores (such as GRE general &amp; subject tests, or a local exam to sit), English proficiency test scores (such as TOEFL), and two letters of recommendation. Successful applicants are offered scholarships which might include tuition-waiver, free on-campus housing, and a monthly stipend (enough for comfortable life according to the local life standarts). The M.S. and Ph.D. degrees are usually obtained in 2 and 4 years, respectievly, with 7 course requirements (usually in the first year of M.S. and Ph.D) from the list of fundamental physics courses and special topic courses. Following the course work, the student must work on his/her M.S. thesis or Ph.D. dissertation studies along with the department’s research interests. All students should have an academic supervisor by that time. Candidate Ph.D. students must have an M.S. (or equivalent) degree, and have to pass a qualifying exam during the course of their studies.